Where is identity management heading in the next five years? Join Radiant Logic and TechVision Research for an important discussion of technology trends and learn how a federated identity and directory service is a vital part of your digital transformation. Large enterprises often have complex identity infrastructures already in place; with identity data spread across many heterogeneous data sources—multiple AD domains and forests, other directories, databases, applications, web services/APIs—along with a multitude of legacy applications that rely on those sources. 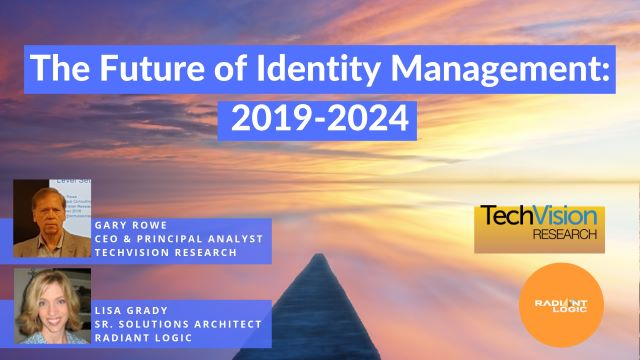 To prepare for the future of IAM, enterprises will generally require a rationalization of, integration with, and ultimately migration to this next generation identity infrastructure. Responding to change in identity and access management can be an expensive and complicated proposition. Many large enterprises have security systems based on legacy LDAP directories (Oracle OUD, Sun, IBM TDS), which are now aging. But with multiple applications relying on this directory infrastructure for authenticating and authorizing users, companies have been stuck with the existing inflexible system. Compounding this problem is the extra demand from cloud and web-based applications and an ever-growing/changing user base with high expectations for secure and seamless user experience. As a result, companies are caught between a rock and a hard place. They need a way to migrate away from aging LDAPs without disruption and evolve the infrastructure to deliver on those new expectations. Most IGA tools excel at governance and administration—once they have a complete picture of your identity infrastructure. To achieve that, they depend on a set of generic native connectors to the identity sources along with time consuming and expensive custom coding. But the value of governance, the ability to apply rules and policies that limit or grant users (such as employees) access, is directly related to the quality and richness of the identity data itself—what can be extracted, reverse-engineered and aggregated. The higher the resolution of your identity data, the better the governance. When it comes to capturing higher resolution identity data from directories—details about membership in a group or a nested group in directories such as AD, or a system/API—a federated identity and directory service offers many benefits. Whether your goal is streamlining authentication/authorization processes after a merger, providing a unified view of users for existing on-premises applications and cloud applications (moving to Azure AD/Office 365), or boosting the security of your system, there is most likely an Active Directory consolidation project in your future. The challenge for any medium to large enterprises and organizations is that their identity infrastructures often contain multiple AD domains and forests. This fragmentation is a technical challenge for multiple applications and use cases that require a more unified view of workforce identity for security, authentication, and authorization. •leverage virtualization and federated identity to solve the challenges of physical AD consolidation with a logical consolidation. •achieve full integration and rationalization of identity data from across multiple AD domains and forests—without a system overhaul. •achieve flexible new group definition and remapping of existing groups in environments where identity from multiple silos needs to be consolidated. •simplify authentication/SSO and authorization for multiple classes of applications, including legacy LDAP, traditional Web Access Management, and Federation/Cloud IdP.